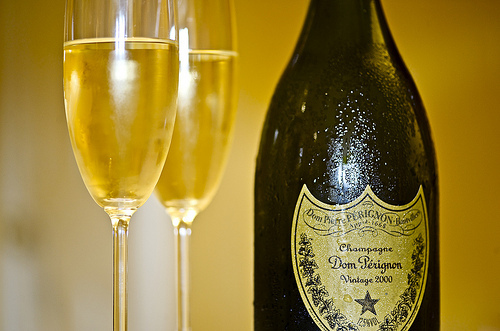 Food Costs > How Much Does Dom Pérignon Cost? How Much Does Dom Pérignon Cost? Dom Pérignon was known to innovate and perfect his creations, from the vineyards up to their preservation in the cellars. Known as a vintage champagne, Dom Perignon has been said to be a very delicate champagne, tasting of floral notes and packed with fruity flavors such as lemons and peaches. The winery will only produce wines from the highest-quality grapes, and after the wine matures, it’s only released for a number of years in order to allow it to mature. Even though it may have a delicate taste, connoisseurs say the wine has great depth and complexities. Depending on the vintage, some years have hints of dark berries, tropical fruits and almond-like tastes. Today, Dom Perignon is said to exclusively use Pinot Noir and Chardonnay grapes from only the finest growths and vineyards. How much does a bottle of Dom Perignon cost? The price of Dom Perignon will greatly depend on the year it was produced. its vintage age and where/who you purchase it from. If you don’t care about a vintage wine and want to purchase it at a local wine retailer, then you should be prepared to spend anywhere from $150 to $400; however, if you’re looking at a wine from years ago that has peaked for 20+ years, then the prices could reach well into the thousands. This Business Insider article, for example, said a bottle of Moet & Chandon Dom Perignon by Karl Lagerfel, which was a special edition released in 1998 retailed for $1,955. While the vintage year can matter, it will be the vintage age that can drive the price up. As the champagne begins to age, the winery won’t release it until it has reached the first year of maturity. When they do decide it has met either the second or third peak of maturity, which is 15 to 25 years after the vintage label, then they will apply the Oenotheque label, which can greatly increase its price. For example, at Wine.com, they list 10 Dom Perignon varieties, with prices ranging anywhere from $180 to $400. Most of the wines listed were manufactured in the early 2000s. On Amazon.com, a handful of listings range anywhere from as little as $195 for a 2006 bottle to as much as $589+ for a 2004 bottle. Costco, at the time of this writing, was offering a bottle of vintage 2006 Dom Perignon for $132,99, according to CostcoWineBlog.com. Refer to our table to see what some years may have cost you if you wanted a vintage bottle from that particular year. We scoured the Internet and listed the prices we had found from reputable wine retailers online. If purchased online, you may have to pay shipping costs. A bottle of Dom Perignon will always be best chilled at 50 to 55 degrees Fahrenheit. If storing at home, it’s critical you have the right setup to keep the champagne aging appropriately. If you have your eyes on a certain vintage year, it’s best to research it first as some years can taste much better than others. Some years, for example, may have a collector’s appeal, which is the reason for its higher price. In this eBay buyer’s guide, they say the 1961 vintage year was served at Princess Diana’s wedding, which means a higher price on the market most of the time and has nothing to do with its flavor. The vintages can go back as early as 1921 to as late as 2010. Shop around. However, don’t settle for the cheapest price as there are many fraudulent sellers online. If you want to purchase online, just make sure you do your due diligence ahead of time to ensure you’re purchasing from a reputable seller.